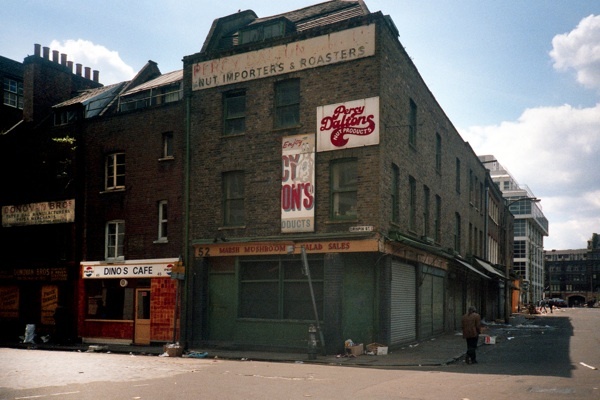 The Fruit & Vegetable Market in Spitalfields was served by an array of all-night cafes which became focal points for those that worked there, and Dino’s Cafe in Crispin St was one of the most celebrated. 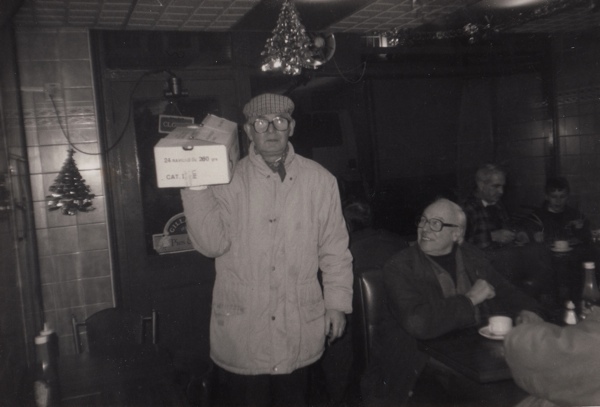 The lively social life at Dino’s grew famous for the high jinks that took place – such as the time someone brought a chimpanzee along dressed in a boiler suit and it went berserk when an Irish tramp in a cowboy hat began to play the accordion, or the occasion when the chain in the dark old toilet was replaced by a piece of dead poultry hanging there, so that when customers reached up to flush they grabbed a pair of chicken feet. 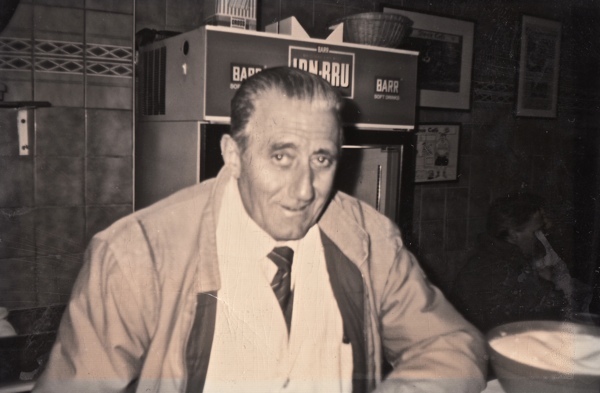 Three generations of the Fiori family have presided over the culinary service at Dino’s for fifty years, welcoming all comers – lorry drivers, market porters, salesmen, traders, builders and even lost souls – and they have proved themselves magnanimous hosts, opening each day from three in the morning until three in the afternoon. Today, Dino’s Cafe is a distant memory in Spitalfields because, when the market moved to Leyton, Dino’s Cafe went along with it. 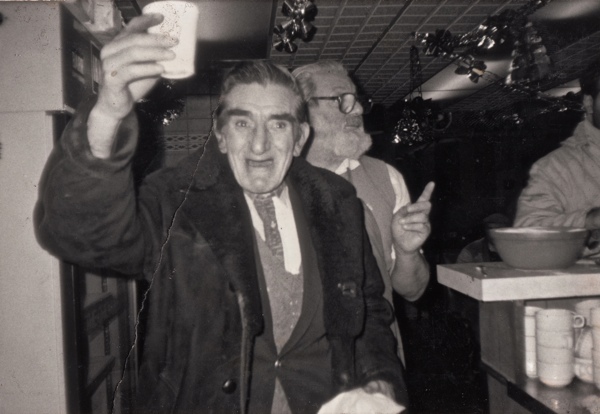 But when I visited last week, I found it as lively as ever, although Ernesto Fiori admitted to me that he still cherishes his memories of Crispin St and brought out a drawer full of yellowed photographs which record some of the lively characters of that era. “It was twenty-one years ago that we left Spitalfields. I know because I was twenty-nine then and I am fifty years old today. 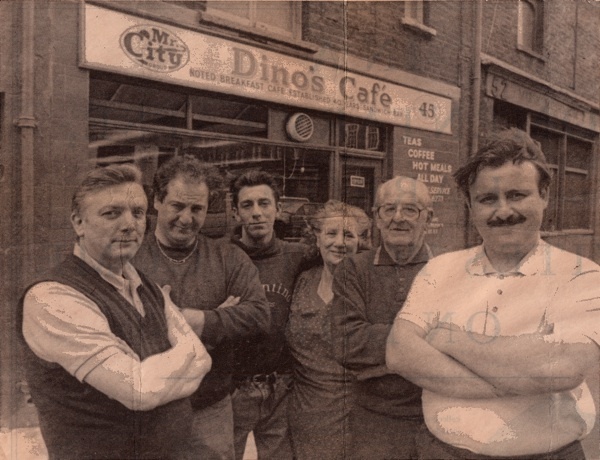 Dino Cura first opened Dino’s Cafe in Crispin St, Spitalfields in 1946. 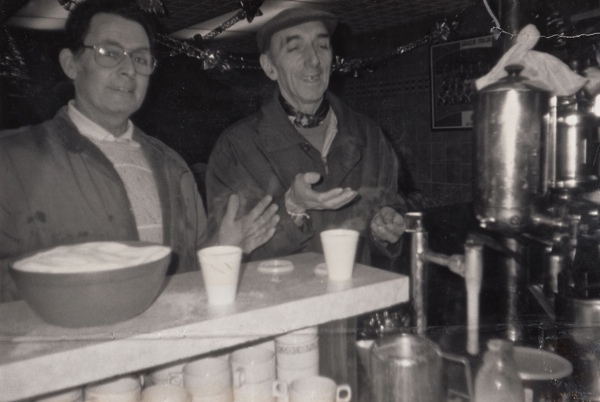 My father Angelo and his brother ran it from the sixties, but when my uncle retired to Italy my father needed some help. So my brother Roberto and my brother-in-law Terry came into the shop. My dad turned sixty-five when I turned eighteen and I had joined straight from school. 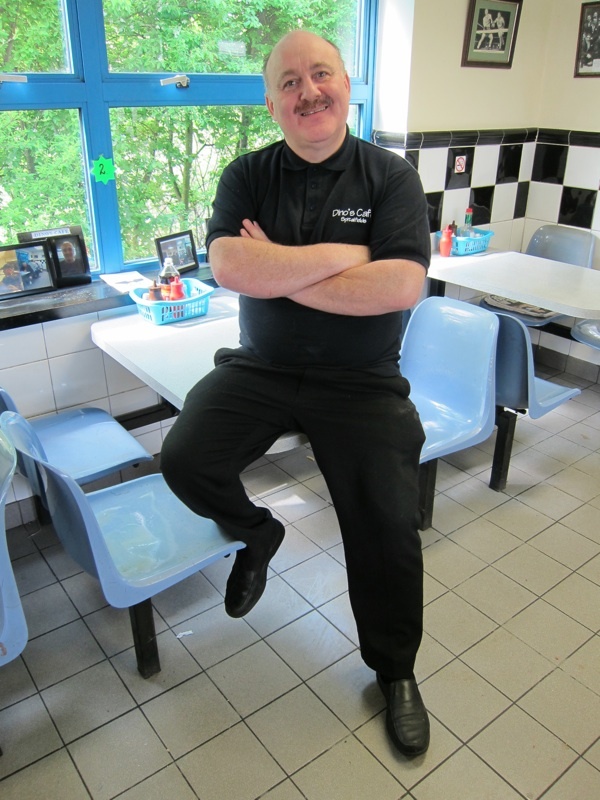 I just loved working there, I went into the kitchen as a cook, serving up eggs, bacon, sausages and toast. It was a wonderful atmosphere and you immediately felt part of a family. Customers became friends, and then they became very good friends and you got invited to their weddings and family celebrations. The biggest thing that ever happened to us was the moving of the market from Spitalfields to Leyton. 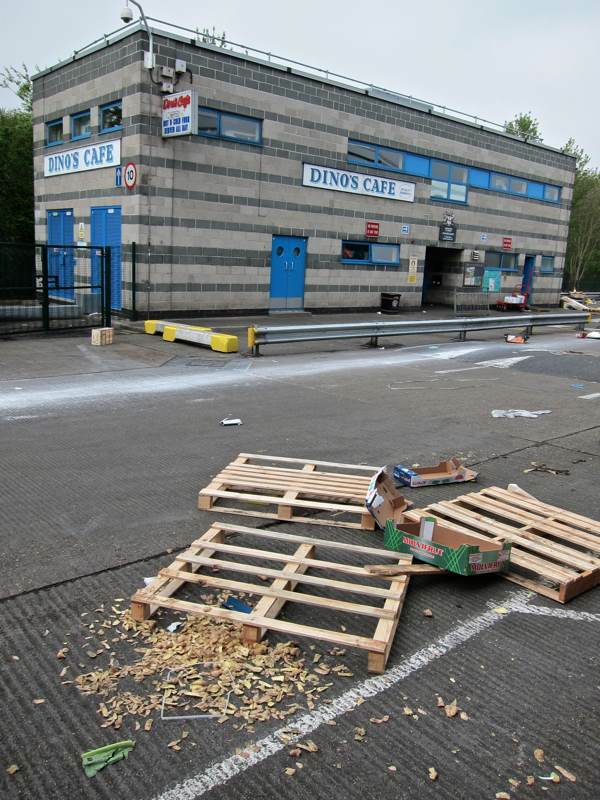 We saw that wonderful old market building, one day thriving and full of life, and the next day empty and abandoned with desks and chairs piled up that had been thrown out of the offices, ready to be destroyed. Although we had a space in the new market, we were one of the very few that carried on our original business in Spitalfields. My mum and dad stayed in the old cafe and we used to come back to visit but it was a desolate place, like a ghost town. 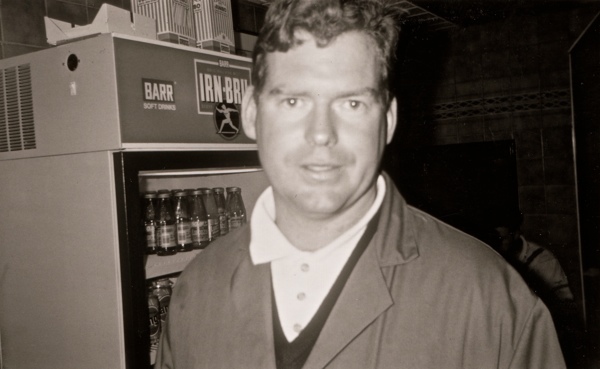 We left the old market on a Friday and we opened in the new market on Monday 13th May, 1991. I arrived at midnight on Sunday and the chaos was unimaginable, picking up a market of two thousand people and moving it from one place to another. Everyone in the industry was there, greengrocers and fruiterers, it was celebration of Spitalfields. It was a good thing, but we can’t help thinking back to the wonderful memories we have. We still talk about our days at the old market. It was all English or Jewish there, and all the porters were English. But as the English greengrocers have diminished ,we have had an influx of Asian traders, some Chinese and a lot of Turkish. 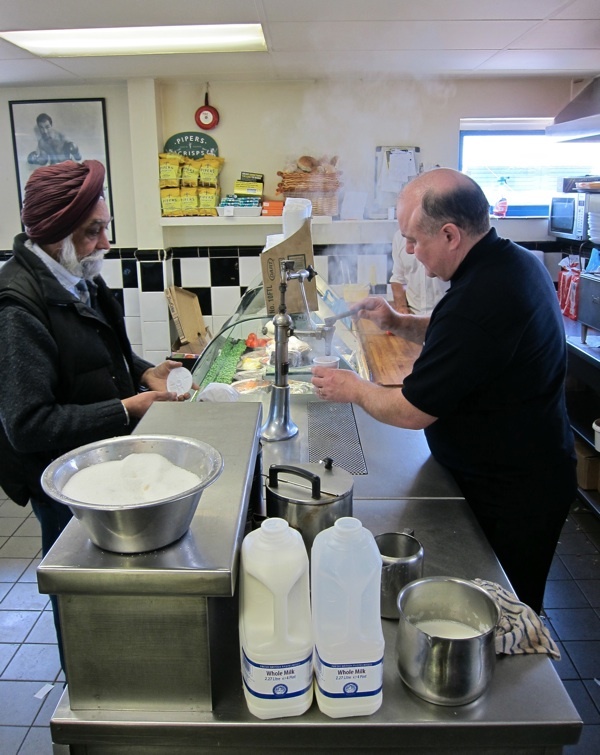 It has kept the market alive, and three out of the five cafes at the market are Turkish now. 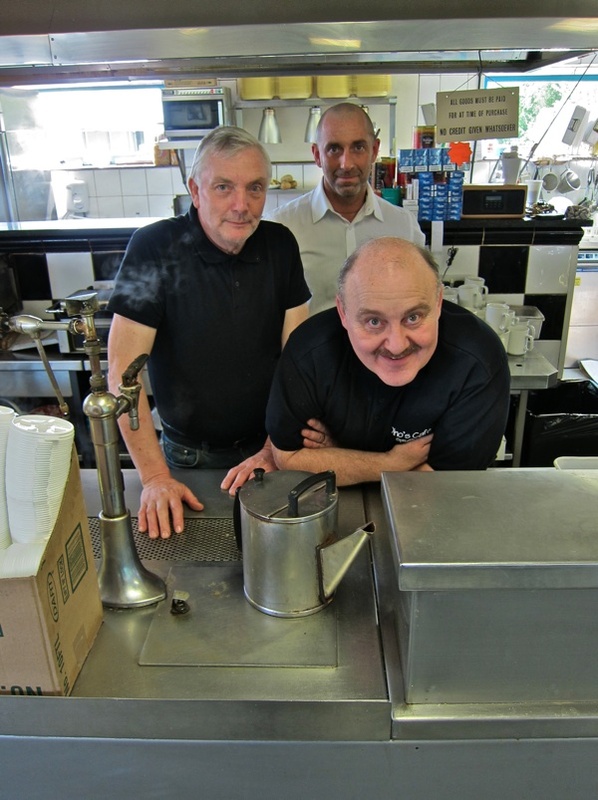 Terry Richardson, Ernesto’s brother-in-law joined Dino’s thirty-five years ago and it was romance that led him there, the story of how he came to brewing tea behind the counter is a love story in itself. The youngest member of the triumvirate running Dino’s today is Steven Richardson, as he explained whilst rustling me up a ham and tomato sandwich. 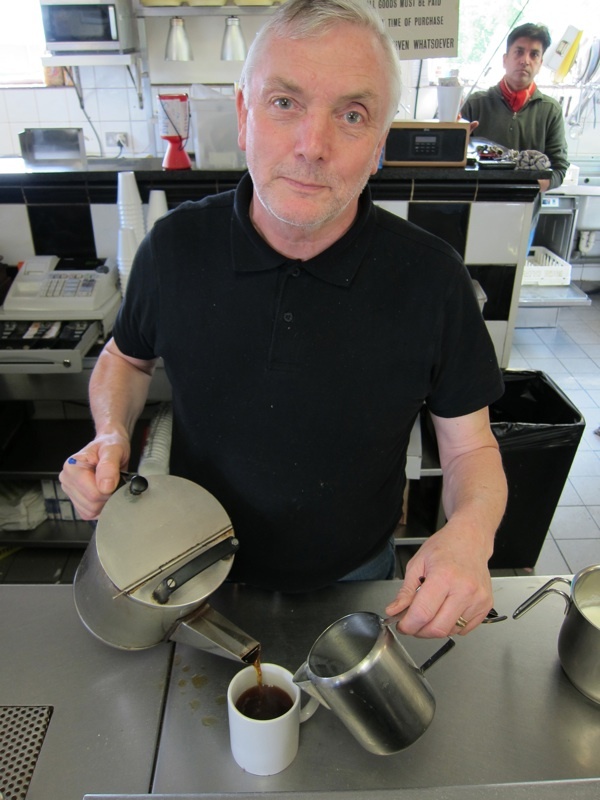 Terry left school at sixteen and started work at Dino’s. 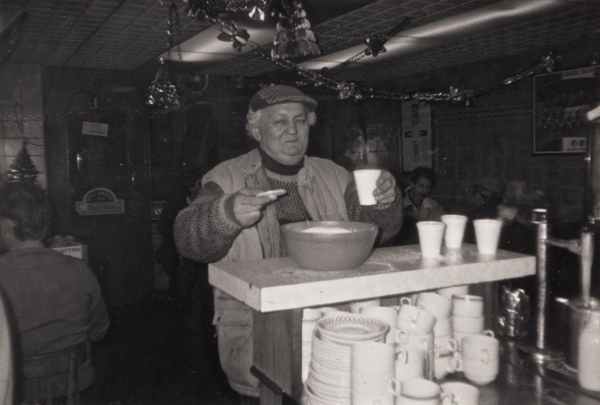 He revealed that his grandparents brought him down to cafe every Saturday morning since he was small. It was his Saturday pocket money job. 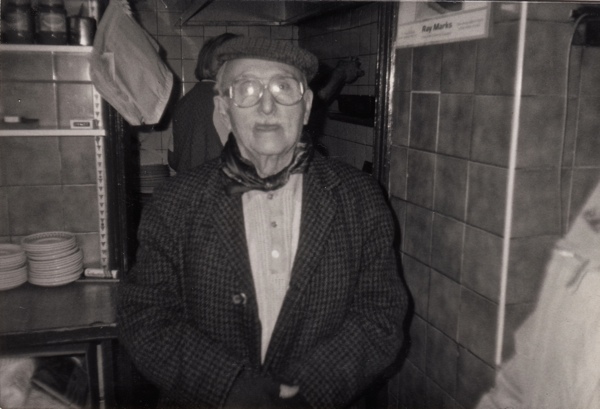 In April 1991, Ernesto told the Evening Standard, “They’re going to make the old market into offices and the magic will be gone. Our way of life will never be the same. 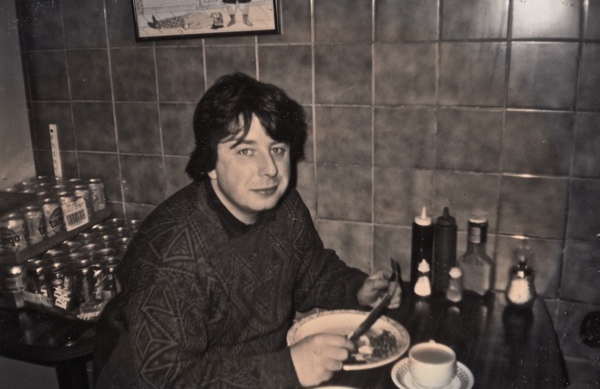 Only people who have lived through this will understand.” Angelo Fiori and his wife Rose eventually closed the original cafe in Crispin St for good, and Ernesto’s brother Roberto opened Mister City Sandwich Bar in Artillery Lane, which still caters to the City lunch trade today. 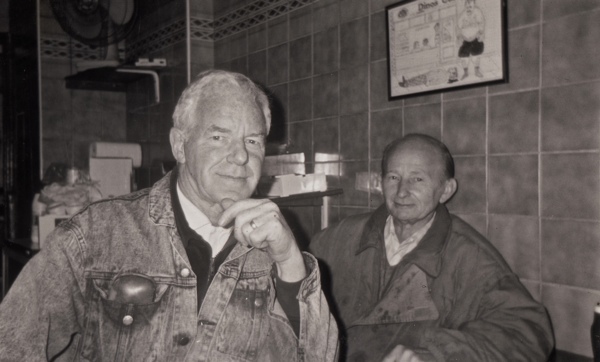 Twenty-one years on, it is a tribute to the conscientious nature of the Fiori family that they have kept their custom and their cafe alive, and their collection of photographs serves to remind us of the magic of the original, legendary Dino’s Cafe. 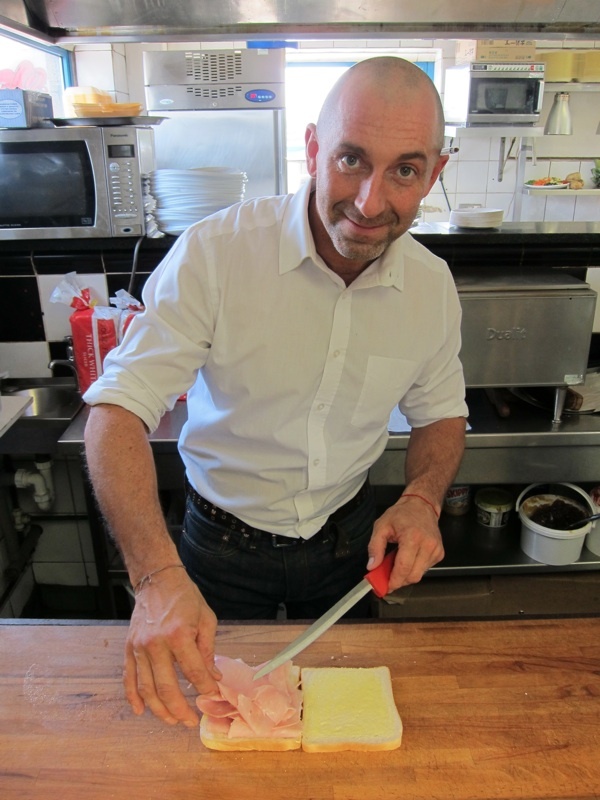 Ernesto Fiori, on the day of his fiftieth birthday – he has worked at Dino’s since he was eighteen. Terry Richardson, at Dino’s thirty-five years. Steven Richardson, started at Dino’s at sixteen. Dino’s Cafe at the New Spitalfields Market today. April 1991, Terry Richardson, Roberto Fiori, Steven Richardson, Rose Fiori, Angelo Fiori and Ernesto Fiori, before they left Spitalfields. 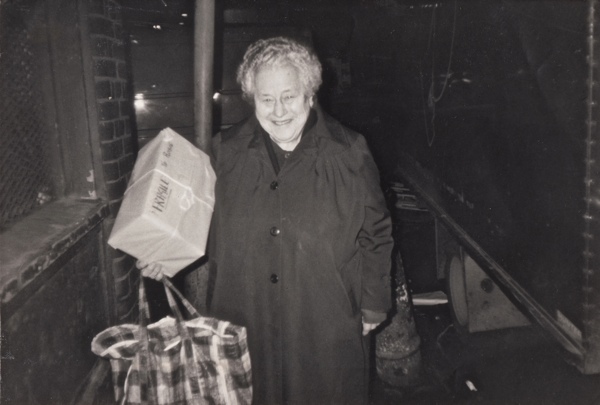 Cuny Applebaum, aged eighty-six, used to take food to the traders at their stalls. Geoffrey Hullyer, Greengrocer from Berwick St.
Bernie Saunders, Greengrocer from Petticoat Lane. Sean Jones, Greengrocer and Roberto Fiori. 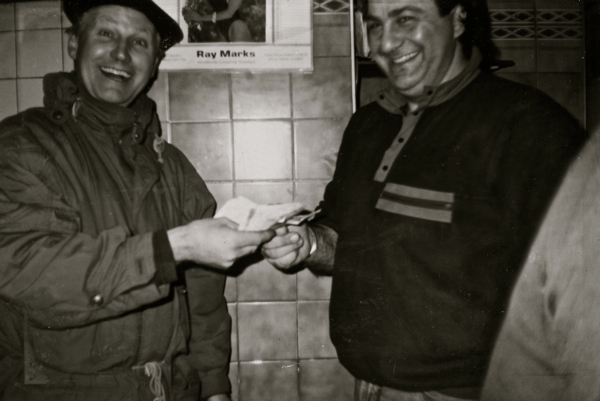 Ronnie Erdang and Ron Dunn, Market Porters. 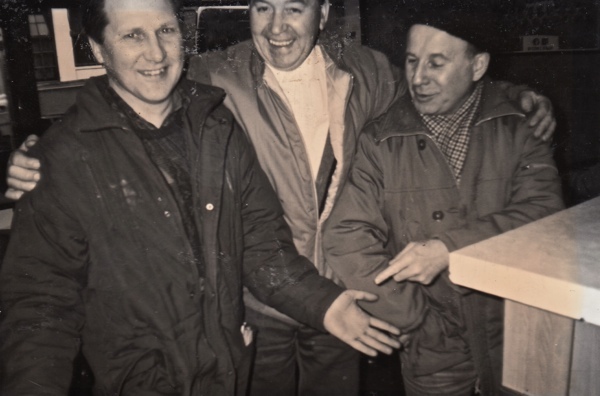 Ronnie Herbert, Stallholder in Bethnal Green and Harry Jones, Greengrocer from Mare St.
Jimmy Godlandson from Woodford and Joey Holmes from Ilford, two big Greengrocers. Ginny, a Jewish lady that visited on the bus every day from the suburbs. Cuzzy, a popular character in the market. 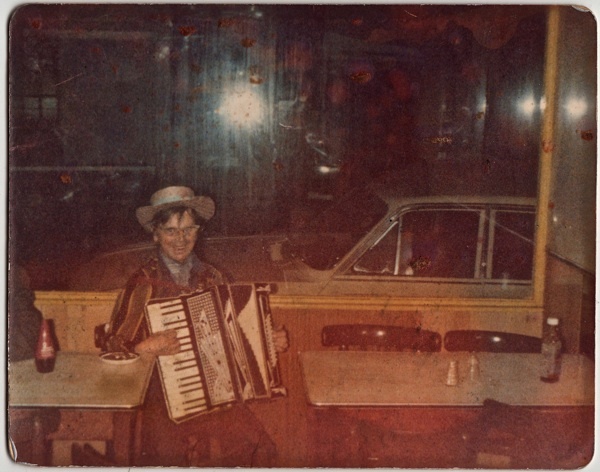 Irish accordion player in a cowboy hat who used to frequent Dino’s in the eighties. 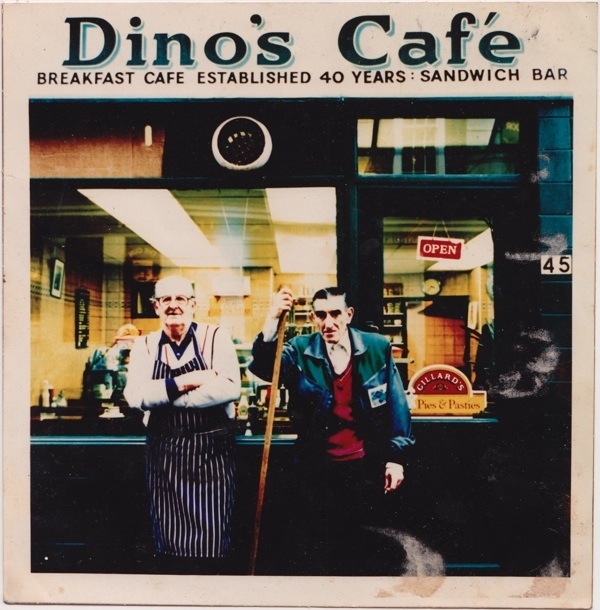 When I worked in spitalfields in the 80′s, going to Dino’s was a Friday lunchtime treat. I’m off to Leyton to see if they still do a “Spaghetti Dino Napoli”! What a wonderful post. These old photos are treasures. As there are only two previous responses, I didn’t want you to think no one appreciated this entry. It is so poignant and wonderfully illustrated. i have join dinos cafe [2o of august 2011]I LOVE DINO,S CAFE . & TO HAPPY ALL SO. Keep up the good work bruv…… ur doing a good job!!!! I have been visiting Dino’s on New Spitalfields Market, since my dad first started taking me with him in 1992. We always used to love your chips! I wish you many more happy years! 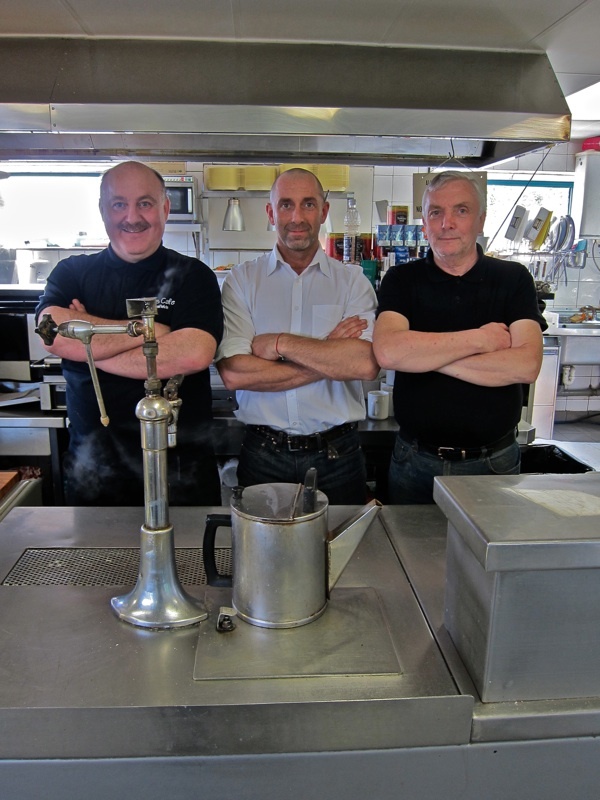 Ernie, Terry & Steve are the guvnors of the cafe game. 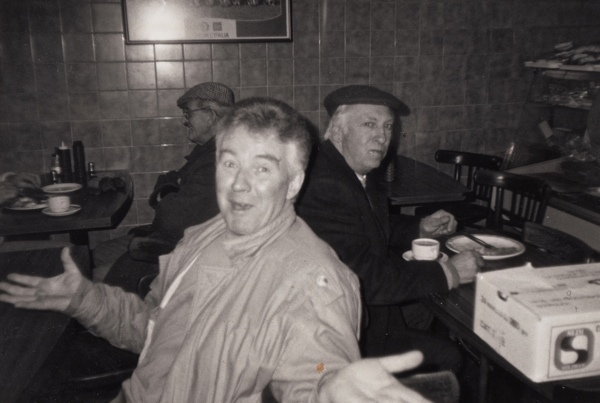 Only 2 true Italian old school cafes in the east end. Dinos is one and Pelliccis is the other. All the rest are just mugs trying 2 B.
Dinos has now moved to the new Spittalfields fruit and veg market near Hackney marshes,.. where you will still see these masters at work. Salt beef is reeeeeemm !!!!!!!! !